After a great day in the park enjoying the spectacular weather, I did not want to fuss over dinner. All this takes is a knife and a few bowls. Prep the potatoes first. Quarter them and in a bowl, mix with olive oil, sage, rosemary and thyme. Toss around so they are evenly coated. Pour onto a baking sheet and spread them out. Roast for 40 minutes until there is a nice roasted crispiness on the bottom side of the potatoes. Cut up the broccoli. In a bowl, micx with olive oil, salt and pepper. Toss around so they are evenly coated. Pour them onto another baking sheet and spread them out. It takes maybe 10 minutes for the broccoli to roast, so put it in about 30 minutes in. Prepare the marinade by mixing the ingredients in a bowl. Then, cut the tempeh into 4 steaks: in half and then into triangles. Place them in the marinade. 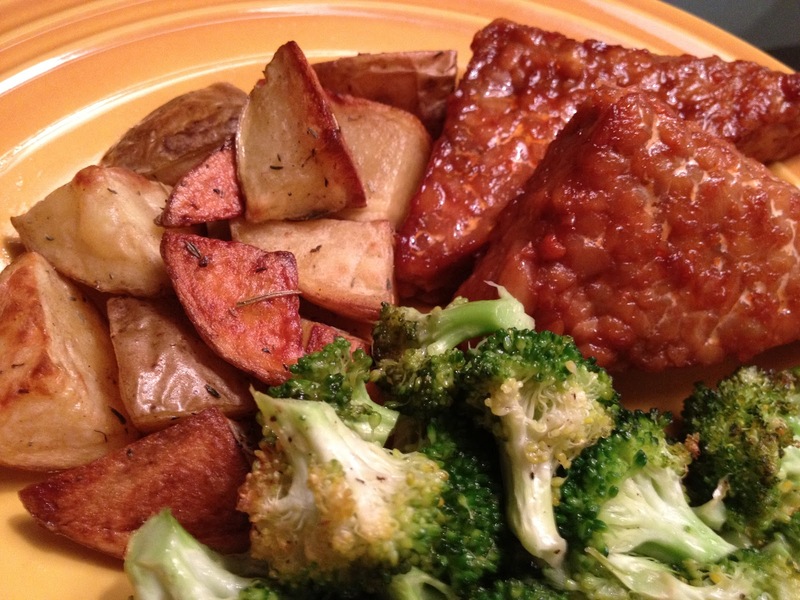 In a pan, heat up sunflower oil, and place the tempeh steaks in with all of the marinade. It takes maybe 10 minutes to cook on medium heat to caramelize the marinade, so put them on right after you do the broccoli. Everything should be done at the same time. Plate it up and enjoy!